In June 2009, I wrote a post titled The Evolution of Internet ADD which chronicled the primary sources of my near Internet addiction. Now, nearly 2 years later, it’s a good time to see how consumption patterns are changing. As you’ll see, the theme now for me is most certainly mobile. Below, here’s how I rate the primary drivers of my internet usage in March 2011, using a qualitative scale of 1-10, with 10 representing heaviest use. 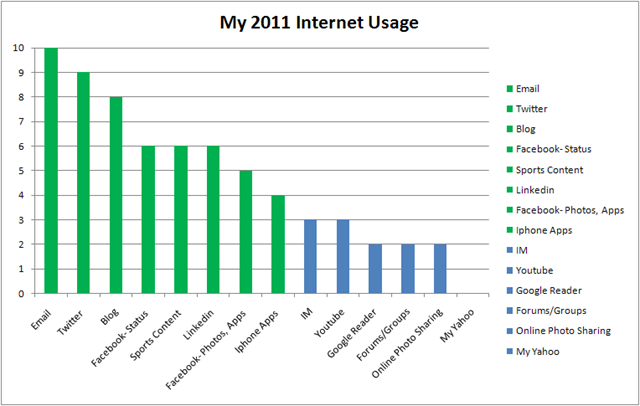 In this graph, bars in Green represent usage activities that I perform mostly using my Iphone- so mobile usage. And most of the green bar items are accessed for me through an App from Apple’s App Store. In August 2010, Wired Magazine published a popular, debate inducing piece titled The Web is Dead, Long Live the Internet. Basically, the argument was Apps will become the primary access method for the Internet, browser based access would decline. Based on my usage model, I certainly agree with this premise. In this day of social media, E-mail as my primary activity may be surprising to some. With the Iphone, I’m able to quickly access my work, multiple personal, and blogging email accounts easily without having to login and logout each time, which I’d have to do with a browser. Very convenient. Twitter is a phenomenal service, with a variety of Twitter ecosystem apps that push the best content to users. For me, Twitter has replaced my RSS feeds, bookmarks, personal home page like MyYahoo! and the visiting of specific content sites—I just have to follow content and thought leaders and great content is pushed to me. I’ll have a future post with more on why I love Twitter. Like Twitter, Facebook and Linkedin have great experiences on the Iphone. The convenience and portability of those apps have increased their usage for me. The above chart shows the rating difference in my 2011 assessment from my 2009 rating. Green bars mean the activity has increased during the 2 years while red bars mean the activity has declined. My 2 highest 2011 frequency usage activities, E-mail and Twitter, have increased the most during the last 2 years (of activities I did in both years- in March 2009, I didn’t have an Iphone, so I didn’t have any Iphone app usage in 2009 (here’s some info on how I use Iphone Apps). The mobile accessibility are big drivers of this. 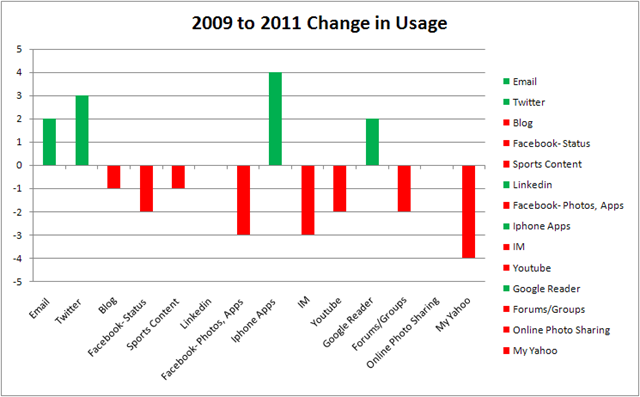 Interestingly, while Facebook continues to grow to more than 500 million users, my usage of Facebook has declined. For me, I’d now much rather use Twitter to get thought leader content than status updates from direct contacts. Google Reader has replaced My Yahoo! as my RSS source since 2009, but both have been replaced by Twitter. So, in summary, the impact of mobile, the emergence of Twitter, the death of RSS and personal home pages… that’s what’s changed in the last 2 years.